Spring has come, and with it, a sense of renewed energy and hope. Even after over twenty years in this country, I still cannot get used to the doom and gloom of winter; my body aches for and craves sunshine and hot, hot heat on the daily. Yes, yes, we live in the “wet” coast, rain is good for the forests, why don’t you go live somewhere else then, yada yada yada… whatever. I have heard it all, okay? I am stuck in Vancouver for a while - can’t exactly help THAT. What can I say? Once a tropical baby, always a tropical baby. My fiancé and I don’t drink - not really. He gets really bad migraines when he ingests alcohol, so he has been observing the dry lifestyle for a few years now, while I am more of a once-in-a-blue-moon social drinker. I like to have a glass of wine or a nice cocktail every once in a while when I am out, but I definitely do not have alcohol every single time I go out for a fancy meal. I like a good zero-proof drink, and I think the mark of a really good restaurant bar program is when they provide beautiful and elegant non-alcoholic options for their diners. We in Vancouver are pretty lucky here; almost every notable restaurant has a solid zero-proof menu… but sadly (and surprisingly!!! ), this zero-proof business has yet to catch in big cities like New York, LA, and Toronto. I dropped by The Modern Bartender in search of earl grey bitters (they had none, sadly), but came across the very intriguing Seedlip. I do think it is similar to the non-alcoholic distillates my friend Dani Tatarin has been developing for quite some time now. Seedlip professes to be “the first distilled non-alcoholic spirit”. I couldn't really picture what this meant… but I guess the analogy I am going with is… when you purchase a bottle of Seedlip… it’s kinda like purchasing a bottle of fine gin… except this gin does not contain alcohol. At all. Not even a little bit. So… yeah… the people behind Seedlip may very well be doing what Dani is doing with Las Animas Botica. Anyway, I was convinced to buy a bottle to try out for myself. I settled on their bottle of Spice 94; I am always a sucker for spice notes in anything, particularly if the flavour profiles detail cardamom as a flavour note. I had wanted to create a spring-inspired mock-tail, so I went to visit my friend Stephen (owner and proprietor of Dickie’s Ginger) to get a double growler order of ginger beer for recipe testing. I decided to keep this drink simple, zesty, and refreshing, so after settling on a raspberry ginger beer from Stephen, I pretty much already had an idea of what flavours I wanted in this drink. 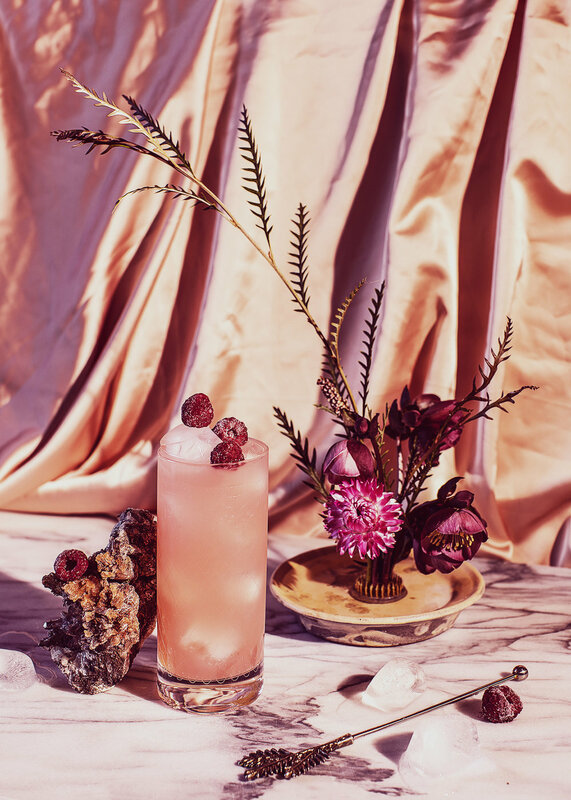 I named this drink Blush because of its blush-pink hue… but if I am being real here, I am just plum out of creative names, so… let’s just go with Blush. Oh, and before I forget… HAPPY FIRST DAY OF SPRING!!! It’s almost 20 degrees out! How lucky are we??? Highball glass. Build over ice with Spice 94, yuzu juice, and Balance distillate. Top the rest of the glass with raspberry ginger beer. Stir. Garnish with fresh or frozen raspberries and a final spritz of Balance distillate.